We’ve got some good news for those of you with rocking the LG Optimus T! LG today confirmed that its Optimus One series handsets, including the LG Optimus T will indeed recieve the new Android 2.3 (Gingerbread) update. But as always, the carrier must also support the upgrade. If the carrier does not support the upgrade, at that point LG can not do anything about it. So how does this make you feel Optimus T owners? I’m betting a lot better than Samsung Vibrant owners. Nice one LG… that’s the way provide customer support. It’s better to get updates to your customers! Samsung and Moto, I’m looking at you. So LG, as of now is the best company to get a phone from to be able to receive updates? LG is a good company. T-mobile in Europe has been carrying LG mobile phones for some time now. I would get an Lg before a Samsung. We need more of this. It shouldnt be like pulling teeth to get the manufacturers to announce their commitment to an upgrade or not. Samsung is scratching their A$$ and B@! !$ instead of letting us know what direction they’re taking. Its sad to say a thing like that aint it? Nice… strategy LG cuz that way you are going to gain more customer. I personally like the looks of the Samsung Vibrant better but you got me thinking if is all about looks. Nice… strategy LG cuz thats the way you are going to gain more customers. I personally like the looks of the Samsung Vibrant better but you got me thinking if is all about looks. I feel for you Samsung users. My wife is getting me the Samsung Galaxy tablet for my birthday in a few weeks. This actually makes me nervous about getting it. The ironic part is that I do have the Optimus T and am excited for the 2.3 update on it. I think i’m actually impressed by LG now, meanwhile Samsung makes me nervous. I had the Samsung Behold II and now I’ve had my Samsung Vibrant fo r about 2 weeks now and I love it, and I literally can’t find a single problem with it. I was so happy that smashed my Behold II with a hammer. YES!! mine too. If an LG supe r-monster phone comes out, i’ll trade my nexus s + 200 for it. what do you think would be better (for me)? trade my nexus s + 200, or sell it for 350-400 on craigslist? LG deserves praise for this as it is a rarity to get Andriod updates with other manufactures. Optimus T definitely deserves another look simply because of it getting Gingerbread. the Optimus is a great VALUE priced phone! packs a ton of punch for the price, but for 239.99 retail what more can you ask for. I lacks any ability to download movies or such but who really wants to watch a movie on their 3-4 inch screen. I have a vibrant and have never used that feature. For a 1st time andriod user or someone who simply wants a good phone for a reasonable cost this is it! And why does it matter that the G2 doesn’t come with a 1Ghz chip? The one it has is faster than 1st gen 1Ghz. And can be overclocked way above that. Man F samsung I will never again buy a samsung product ever again in my life, i took a chance bought a vibrant thinking this maybe a phone they would support months after but this damn phone just makes me want to go spend more money and switch to something else, samsung is garbage and i hope they go bankrupt.. As for this post well Im happy for Optimus T owners.. Hate to burn your bridge, but its NOT samsungs fault. They have released 2.2 for their phones and other carriers that have the same phone as t-mobile (vibrant) are updating to it. The problem lies solely with T-mobile USA….. people need to get the facts before giving a bad opinion…… as for me, I rooted my Vibrant to get 2.2, and love it. Its a damn good phone beyond the lightness of it, but I am happy with it. It is light years head of the G1 which I got as soon as it can out 2 years ago. (back to the issue), any body still made at HTC for not updating their phones??? the mytouch line was suppose to have it including the slide…… still waiting…. why, HTC???? NO T_MOBILE!!!!!!! Actually T-Mobile has had the 2.2 update for the Vibrant for a while. And the MyTouch 3G Slide got it a while ago. Get your facts straight before you talk crap and look stupid. It is a combination of carrier and manufacturer. Sometimes the carrier wants to do the update OTA but the manufacturer can’t figure out how to do it. Sometimes it’s the other way around. But in the case of the Vibrant and the MyTouch it was Samsung and HTC who held those up. Why? Because GSM has more capabilities and it takes longer to prepare updates for custom a UI. Have a nice day. Does Tmobile support this for sure? When is the update suppose to be happening?! Anyone in the US know when/ if T-Mobile is going to support this upgrade? I know this is VERY late, but when exactly is this happening? Sprint rolled out Gingerbread for the Optimus S on 9/14/11. It was full of bugs so they stopped on Sept. 28. ~Benjamin G: Welcome to T-Mobile Chat service. My name is Ben and for your reference my rep ID is 13-20444. First, please allow me one moment to review the information you have provided. ~Benjamin G: Hello Daryl, thanks for waiting. ~Benjamin G: So, how can I help you ? daryl kim: LG has promised an update of 2.3 for ALL Optimus line phones, i understand each carrier is different and has to approve or decline the update. is T-Mobile going to approve this update? If so, when can I expect it? 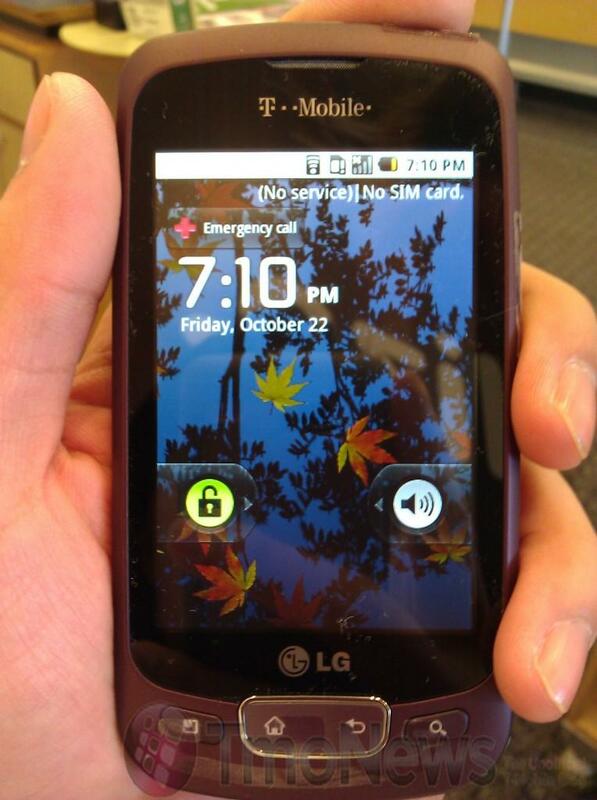 ~Benjamin G: From the information that I have, LG has not yet released the gingerbread update to T-Mobile. Currently, we have not began rolling out this update, and it is not currently available from us. If LG has made that promise, we should be getting information about this very soon. daryl kim: Do you have any information about whether or not its in the works? ~Benjamin G: Unfortuantely, I do not. I can tell you that we normally do hear about this kind of thing, but so far I have not heard anything about possible gingerbread updates for the Optimus T.
daryl kim: Are you able to tell me if TMO will support the update if LG does infact release one? ~Benjamin G: If LG releases one, we will, yes. The only instance I have heard of us not bringing around an update was for the Motorola Cliq XT, and that was because motorola said they could not develop a stable update. We would not deny an update if it is made avaialble. daryl kim: Okay thanks for all your provided information, been a great help. ~Benjamin G: You are very welcome, I’m glad I could help you out with this. I had the LG Optimus T for 2 years. The most horrible smartphone a person could ever ask for. It never even received the update it was promised 2 whole years ago. So glad I’m getting a new phone. I regret ever getting this phone and am glad hat these 2 horrible years with this phone are coming to a close. Good riddance, LG Optimus T. You will never be missed. And if somebody considers getting this phone, please don’t.